PE provision is assisted at Waverley by PE Premium funding. This page is dedicated to PE activity at our school with examples of PE funded activity. You can see the work the staff and pupils undertake in the areas of gymnastics, games, outdoor adventure, dance and athletics. We are keen also to demonstrate our extra-curricular activity and sporting teams. Health and fitness are also features of physically active pupils and this will also be documented during the sporting year. We have entered a partnership with several local schools within The Outer West Learning Trust to provide specialist PE and staff development work. We will do this by utilising the services of an experienced specialist PE teacher across the schools and their phases on a weekly basis. Further funding will be utilised to provide sports clubs at school. We have forged partnerships with Premier Sports to provide high quality after school provision and lunchtime clubs as well as inter school competitions and tournaments. 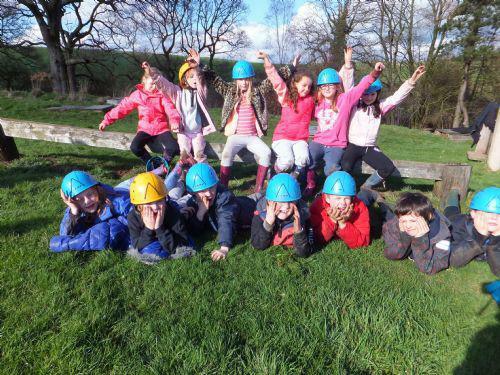 We have invested in the training of a teacher who specialises in outdoor education. Waverley intends to utilise PE Premiun in order to sustain this aspect of the PE curriculum with all pupils in school undertaking outdoor adventure activities within the outdoor classroom area and in Scotswood Dene. Our year 4 pupils are all aiming to swim 25m by the end of the summer term. They travel every week to West Denton to work towards this goal. The children will be given swim caps by the pool in week 1. The pool policy states that earrings of any type (including studs) must not be worn. The Golden Mile Details of our Golden Mile inititive.